"Lucy Boston - Patchwork of the Crosses"
I set myself up for a little lunch time stitching earlier in the week. I managed to prepare three more blocks and then decided to start adding the next ring to a block to see how my idea of the many different tone on tone fabrics were going to look. ring as there are in the center. Lots of in car stitching in my future with the football season starting. has been added to my week. The blocks look good, I have a little rubbery clover thimble with a metal cap that is okay. These blocks are looking so beautiful I love seeing each one. It will be stunning, looks like a yummy lunch. First time comment but have been following . Love your LB's. I have started those as well after seeing Linda Franz's book. Got the book and some templates made and have started. Where I go for patchwork weekly "fixes" they are creating quite a bit of interest and love. Two of my friends are also going to do these. It is truly a lot of fun. I also decided I must do the surrounding background pieces as I go otherwise it could be quite boring just doing those and the little squares. Please continue to show your progress, they are so lovely. Shirley N.Z. The blocks are lovely. Love the fabrics that you have used. This quilt will be beautiful. These are lovely. Did you get the templates from the book? When will I have the time to start this one?! Your blocks look great, Sharon. The blocks are looking wonderful and it looks like lots of stitching time in your future. I was given the suggestion of simply using a few layers of masking tape on my finger instead of a thimble. It seemed to work well for a while until I finally found a thimble to suit - leather with a small metal insert in the cap. I think I bought it at a quilt show. 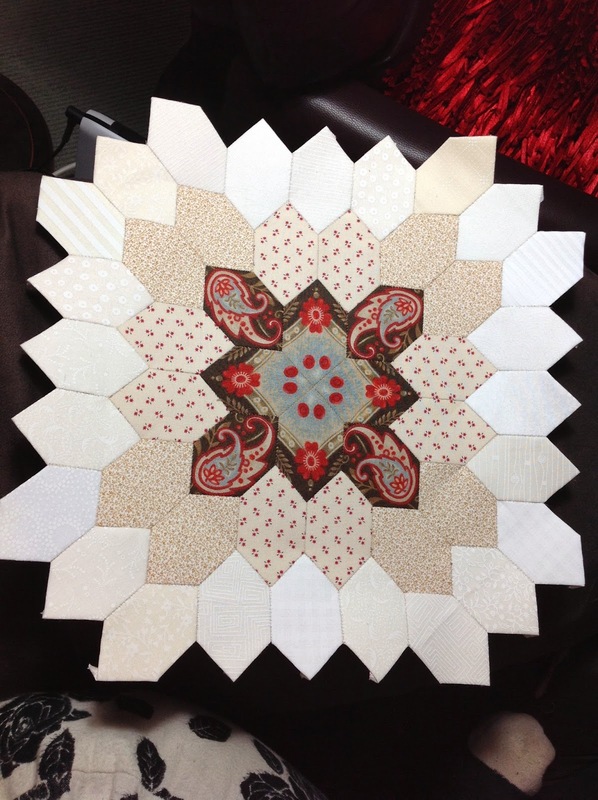 Beautiful blocks Sharon, its going to be a gorgeous quilt when you finish. 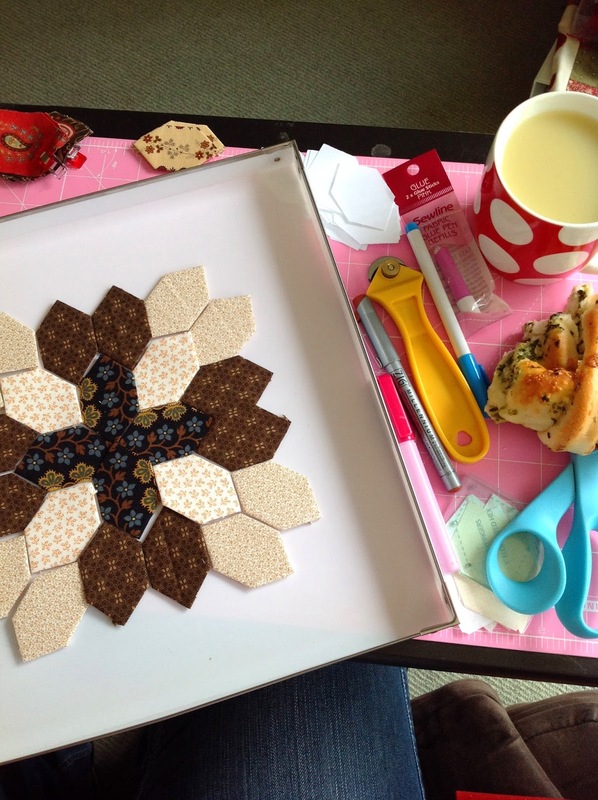 Beautiful blocks, I love having small stitching projects for times when I'm just waiting around. Very pretty! I like your many tone on tone neutrals. Those blocks are stunning. I had to persevere for a while before I got used to a thimble but now I feel undressed without one!! Have you tried vet tape? They look great Sharon, and I do like your low volume backgrounds. I use a simple metal thimble with the ridge around the top, and wouldn't be without it. The blocks all look fantastic. Why is the top of the needle going through your finger? It only happens to me when I hand quilt through layers. Have you tried a new needle after every 10 hours of stitching? You would be surprised how much easier it is with a sharp new needle. 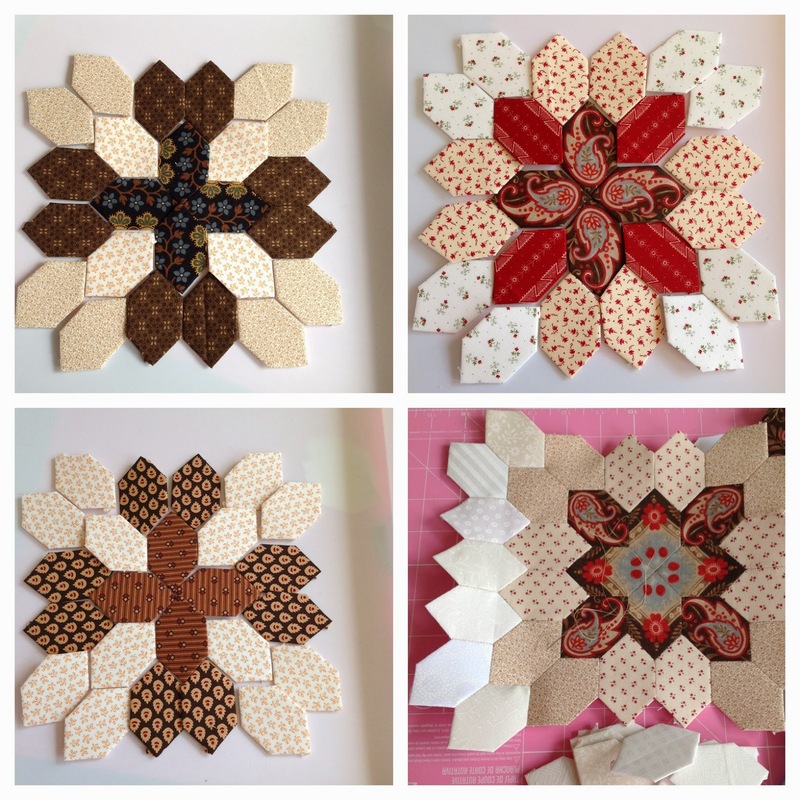 I am loving all the Lucy Boston blocks cropping up all over blogland - so much so that I am getting very close to making some myself - maybe a knee quilt - I have been patchworking and quilting bigger quilts since 1980 and I am so ver it but this just might be a deal breaker!! Love your colour combinations! !